Cambridge English for Schools offers an exciting approach to English for students from eleven to sixteen years old. The Workbook Audio Cassette - American Voices contains American English listening material to accompany the Workbook. 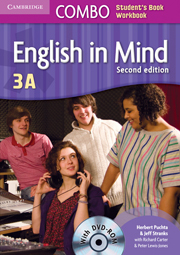 Class Audio - American Voices to accompany the Student's Book is available separately.  Relates English to learners' own lives, other subjects in the school curriculum, and the world at large.  Recordings with American voices for learners needing greater exposure to spoken American English.  Opportunities to link up with classes in other countries, through the Parcel of English scheme.